Revitalize Your Day with Maxwell House Coffee It's time to turn your morning coffee cup into your most favorite coffee just simply stir into hot water or milk and enjoy an instant French vanilla coffee You can put French latte sticks into your hands bag too, very convenient and easy to make instant flavor coffee makes your morning entice and lovely. 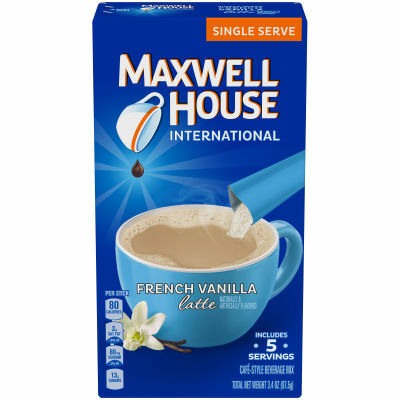 Enticing and Highly Aromatic Maxwell House International instant café-style French Vanilla Latte is like coffee at your own home. Delight your senses with this creamy and velvety taste of French vanilla latte. Treat yourself or share with your friends the highly aroma and tasteful Maxwell House coffee.